"...The first two aircraft (AU-1 and AU-2) are due to arrive at Royal Australian Air Force (RAAF) Base Williamtown in New South Wales on 10 December, the Department of Defence (DoD) disclosed on 3 December. Production of the first two Australian F-35As began in 2011 with those jets being delivered to Luke Air Force Base in Arizona in December 2014. The aircraft have been used for pilot and maintainer training. The two aircraft will be flown by 2 Operational Conversion Unit at RAAF Williamtown, leading the way for the re-equipping of 3 Squadron at the same location...."
Actually it's 009 and 010. But hey let's not let the truth get in the way of fake news. So... with more UNGOOD research (why do I bother - no one pays me - I'm not a journalist and we will find out soon enough what the side numbers are for these 'first two Oz F-35As - IF 'beepa' is NOT UNGOOD INCORRECT with them. I should run a journalist research school from here - freck this FORUM has an HUGE amount of info - HHUUUGGGE!!!! https://australianaviation.com.au/2018/ ... pZlTsbN-eg "The first two Royal Australian Air Force Lockheed Martin F-35As to be based in Australia have departed Luke AFB in Arizona, bound for RAAF Base Williamtown. Thanks. I've been out watering the garden in the light drizzle here - I'm so bored. • procedures for regular monitoring and reporting on risk, cost and schedule to governance bodies, senior Defence leaders and Defence Ministers. Defence has not, however, provided all of the annual updates to Government that Government required in its approval of the project. 8. Defence has undertaken effective planning for its JSF related infrastructure, workforce and training system, and is achieving progress against relevant plans. Defence has identified and managed risks relating to these operational enablers. Necessary works have been undertaken at the JSF’s main base (Royal Australian Air Force Base Williamtown), but works at other bases have been deferred or delayed to manage pressures on the infrastructure budget. 9. Defence has planned for and made progress in implementing the arrangements for the ongoing sustainment of the JSF. The effective implementation of Defence’s ongoing sustainment arrangements depends largely on the United States Department of Defense delivering the Global Support Solution, which is still maturing. Defence is managing risks associated with the developmental nature of the JSF supporting systems as well as cost pressures related to establishing Australia as a regional maintenance and warehousing hub for JSF aircraft...."
Makes sense to get some rest - maintain aircraft - for the big day on the 10th. I'll get back to my snoozing now. Pacific from Hickham to Amberley in nine hours under the callsign Aussie 1023...."
Via Google earth the great circle distance Hickam/Amberley is just over 4,000 nautical miles. The kettle that wouldn't boil finally boiled. The F-35s arrived today; I saw them fly over, but my position was too bad to get any photos. I'll see them flying around a lot in the coming years, so I'll no shortage of photo opportunities. Arrived where but? Another forum entry had them passing Port Macquarie at 0900 today. Wilyton? spazsinbad wrote: :twisted: Arrived where but? Another forum entry had them passing Port Macquarie at 0900 today. Wilyton? 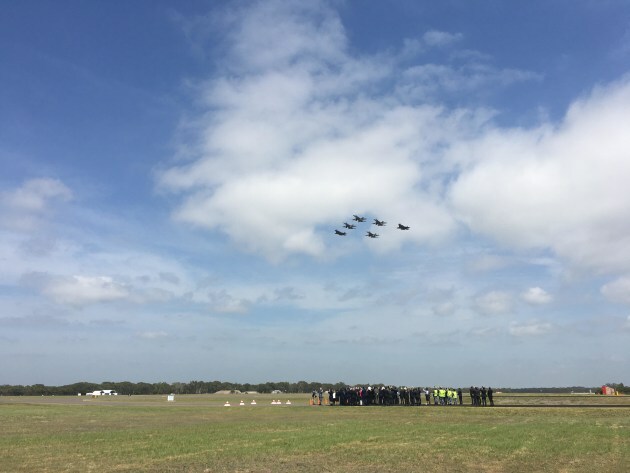 RAAF Williamtown; they arrived around 10 AM as scheduled. ...Chief of Air Force Air Marshal Leo Davies was visibly excited as he took the podium to commemorate the occasion. "How do you excite a RAAF chief?" he asked, pointing to the F-35As. "Whilst it's a modest beginning with just two jets, a dozen pilots and 40 maintainers... this represents the transformation of Air Force. We are evolving our structure and the way we train. "Today, ladies and gentlemen, the naysayers can take a seat.""